We offer an Institute for Food Science and Technology accredited Food Science and Nutrition programme that will give you an in-depth understanding of the scientific aspects of food science and nutrition and the wider implications of diet on our health and wellbeing. This course provides a balanced curriculum exploring the applications of pure sciences to food whilst also covering aspects of how a number of food components affect health. The breadth of topics you’ll study will allow you to appreciate the key positions of food in society, health and well-being, as well as in the manufacture, marketing and retailing of foods. You’ll also build knowledge of related laws and regulations. At the interface between food science and nutrition, graduates will be key in the development of new healthy eating trends. You’ll develop a broad skillset and receive the intellectual training needed to enter a range of careers. This course offers you the opportunity to spend a year working in industry or studying at a university abroad, both of which provide valuable experience and help your personal development. Both of these schemes add an additional year to your course, taking the total course length to 4 years. There is also the option, subject to satisfactory academic performance, to transfer to the MSci, BSc Food Science and Nutrition (Industrial) degree, on which your industrial placement replaces the third year of your degree. The study abroad year enables you to gain insight into the study of food science and nutrition at one of our partner universities overseas. Many students have found this to be extremely worthwhile in helping broaden their horizons in terms of learning about a new culture and improving their foreign language skills. Year 2 modules deepen your understanding of food texture, flavour and taste. You’ll be introduced to the theory behind new product development, with an emphasis on the study of how food components affect the chemical and microbiological safety of food. You’ll come to understand in more detail the science behind diet and health outcomes and will examine the elements and concepts of food allergy. The two options are based on long-standing relationships between Leeds and industry and with other worldwide leading academic institutions. Gaining a place on the industrial placement and study abroad programme is competitive and dependent on the grades you achieve. In your final year, you’ll apply your knowledge and skills to designing new foods, from concept, through formulation and processing, through to sensory evaluation, packaging and marketing. Your team project based on new product development (NPD) will explore the role of food scientists and nutritionists in developing and marketing new healthy food ranges for food manufacturers. You’ll also undertake an individual research project; you’ll be given a choice of topics to investigate, which will relate to the research activity in the School. Taught nutrition modules explore the links between diet and cardiovascular health and cancer. As a student in the School of Food Science and Nutrition, you’ll be taught by world-class experts who’ll use a variety of teaching methods to deliver an inspiring student experience. 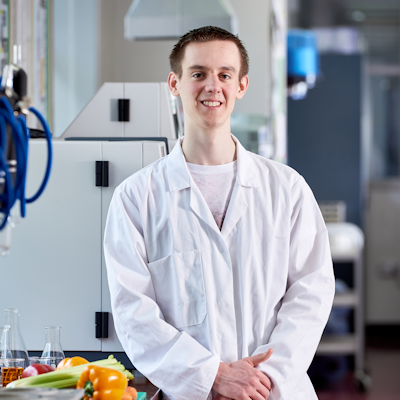 With the continuous support of our staff, you’ll acquire the knowledge and transferable skills relevant for employment in key areas of food science and nutrition, so that when you graduate you are ready to take on the wide range of job opportunities and academic positions that are available. 34 points overall (16 points at higher level, including one science subject). Read about our range of additional scholarships available in the School of Food Science and Nutrition. Spending a year living and studying in another country is a unique experience. Unlike the passing tourist, you have the chance to totally immerse yourself in another culture. You will gain unforgettable experiences and memories that you will draw upon in your working and personal life for years to come. In addition to this, the proven ability to live and work in an international context is an asset that employers actively seek. During your year abroad, you’ll study food science and nutrition at your host institution. As a BSc student you may include your industrial placement as an additional year of your studies, or, subject to satisfactory academic performance, transfer to our MSci, BSc Food Science and Nutrition (Industrial) degree scheme in which your study abroad year replaces your third year at Leeds.